We’ve been hearing a lot lately about the wealth gap in the United States, as well as the growing number of poor people. But what constitutes “poor”? One of the measures used by many is the poverty line. Every year, the United States government puts out federal guidelines about what constitutes living in poverty, basing changes on inflation. Whether or not you are considered to be living in poverty depends on the size of your household, as well as how much money you make. 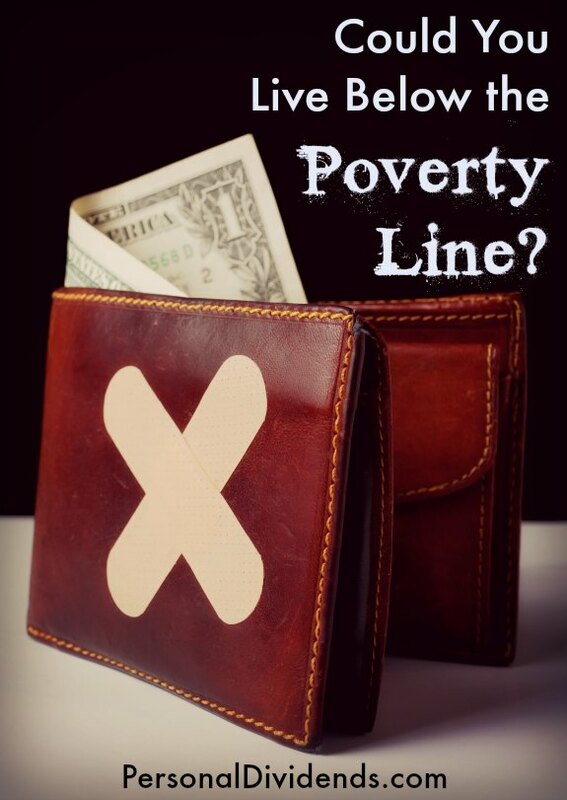 For 2014, the poverty line is drawn at $11,670 in annual income for a single person. For a household of four, you are considered to live in poverty if your annual income is $23,850 or below. Could You Make It Work On Poverty Wages? For a family of four earning $23,850 a year, that amounts to $458.65 a week. Divide that by 40 hours a week, and the hourly wage is about $11.47 per hour. Basically, if you have a family of four, you really can’t make a non-poverty living on minimum wage, which is currently at $7.25 an hour. At that rate, you make $290 a week, or about $15,080 a year. Just because the numbers seem low, though, doesn’t mean that some families don’t make it work. Many of them use some sort of federal assistance to help out. Others live in extreme frugality to make it work. And others end up turning to credit, and live paycheck to paycheck, watching their debt levels creep higher every year. Look at your own household spending. Do you think that you could live below the poverty line? What would you have to give up in order to make it work? Is it even reasonable, with your current habits, to assume that you could make it work? Consider: If you divide $23,850 by 12, you end up with a monthly income of about $1,987.50. Now, add up what you pay for mortgage + insurance + utilities. Just those items alone might very well put you over the poverty line, depending on where you live. As an exercise, try to see what you would have to cut out in order to bring your spending in line with what you would have if you lived at or just below the poverty line. For many of us, that is a pretty tall order. Many of us, even if we aren’t “technically” poor, feel less than wealthy. If you are in this camp, take a few minutes to consider your situation. Are you really as poor as you think? If your income puts you above the poverty line for your family size, it’s worth reconsidering. Think about what you have in terms of non-money wealth. Good health, family, friends, interesting activities, and other items can make up for a perceived lack of money. And, of course, you can always re-evaluate your spending to see if you can improve matters for your budget. What do you think? Is the poverty line an accurate measure of what’s poor? What does being poor or rich mean to you? I could do all of this for a while, but I wouldn’t want to spend my life like this. I don’t think I could live below the poverty line but I did set a goal this year to keep my expenses below the minimum wage level. It has been pretty easy to keep my expenses below a minimum wage income so far. Of course, it is much different living on a minimum wage income voluntarily then it is to have to live on that level of income. I live below the poverty line. And on top of that, I have accrued about 20,000 in student debt. It would be hard enough with the debt, but I make due. One, no car. I bike to and from work every day. No matter what. Snow too high? Have to walk. Two? Buying cheaply made unhealthy snack food is actually a bad idea. We buy bulk, and cook bulk. 50obs bag of rice for ten bucks? Done deal, that’s rice enough to last months. Making your own food goes way longer than constantly buying anything premade. Three, splurge just enough to cut down on utilities. Lined curtains, plastic window covers, space heaters and the thermostat never above 60. Four, no health insurance, no doctor. No if ands or buts about it. Five, cheapest cell phone service available, cheapest internet too, school and all. Six, never go clothes shopping. Or wait until clothes are beyond repair, beyond all hope and then hit up goodwill. Seven, if you can make it, make it. Make our own laundry soap, build furniture out of scrape people throw out, etc. And finally, never miss a day of work. Can’t afford it. 80 hours a week? Bring it on. Sometimes I feel like I’m living below the poverty line. I’m in college and living on my own, so money is extremely limited. Whilst I was an undergraduate student, I lived on less than £8000 – this was at a time when the Rowntree Foundation said that it cost over £10,000 to have an ‘adequate’ standard of living. During this time, I paid off a previous debt, saved for my wedding and saved a little for my nephew too. I learnt to live frugally, but I really enjoyed it. I bought meats and fish that were going out of date at midnight and froze them down. I bought the cheap cuts and made delicious meals in my slow cooker. I got all my books and newspapers for free from the university library, and of course there were a multitude of free events going on all the time for entertainment. I never felt that I was in poverty, although I knew during that whole time that I was on what would have been considered borderline poverty. In fact, I lived in a really high cost of living area, so technically I probably was ‘in poverty’. It’s really all about psychology. I do not need expensive material goods to be happy. I don’t need expensive food and clothes etc. You can get a lot of things and entertainment for free these days.